After spending a good chunk of time on my thesis this morning (yay me! 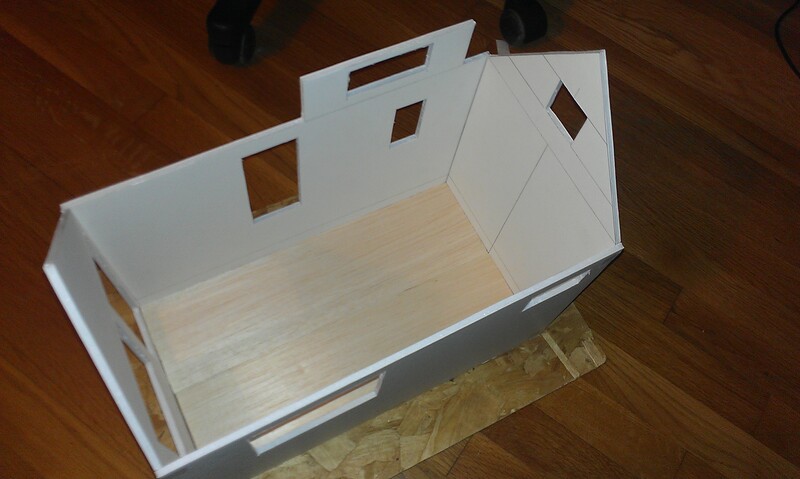 ), my cognitive abilities were pretty much shot – so I happily took a nice break and measured out the walls for my Undersized Urbanite scratch build. I picked up the necessary lumber and foam core at Michaels on Friday, but our weekend was spent visiting friends so I wasn’t able to get to a whole lot (though I did end up making a lot of changes to the staircase – that will almost definitely get an entire post to itself). The Undersized Urbanite rules dictate that any decorating done prior to the start of the contest on September 30 will be disqualified, which rules out any painting, staining, or woodwork I plan on doing since that will all be part of the decor. 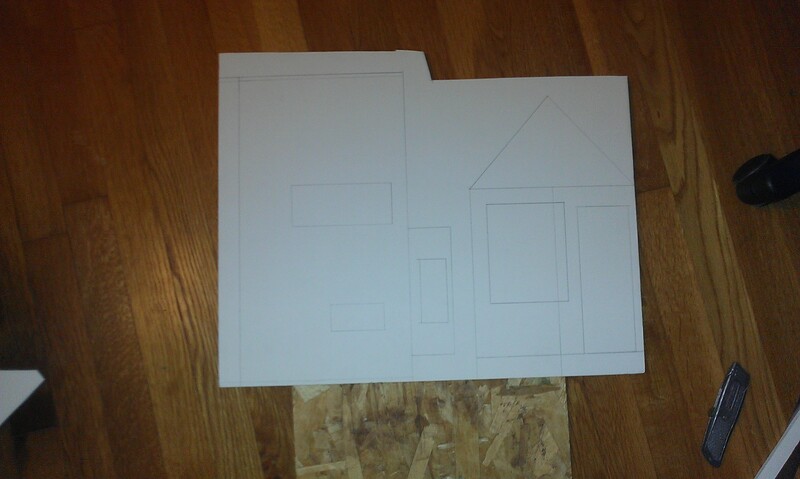 However, because the contest does allow any dollhouse – pre-built, kit construction, or scratch-build – I did decide to go ahead and cut out the pieces I had drawn up on foam core. When I start putting it all together at the start of the contest (since I will have to be decorating as I go) it will go together more like a kit build. 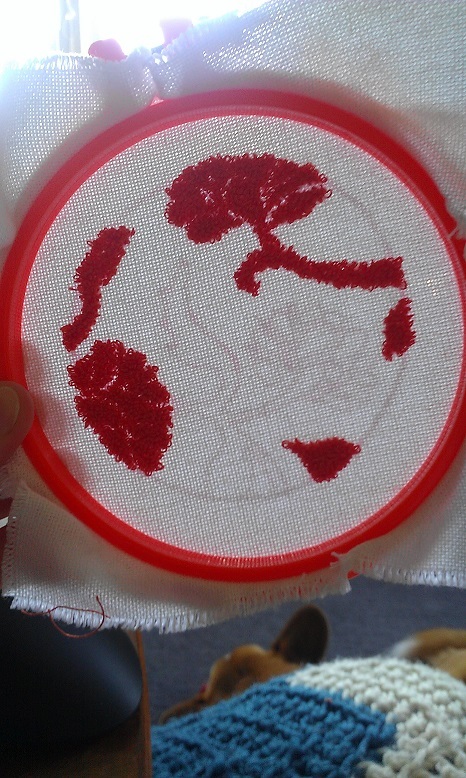 Briefly pieced together with scotch tape! This may have been a really bad thing because now I just can’t wait to get started. Hopefully I can divert this energy back into my thesis until the contest opens…ideally, I’ll have a finished draft of my proposal at that point and be just about ready to defend it! Also, stay tuned: Coming soon, I’ll be showing off my absolutely favorite, must-have tools for miniatures work and building. I always pick up so much when others share their most useful items for crafting, so I thought I would put together a post on it. I’m Abbe. I love miniatures. I’ve finally created a blog after ruminating on it for about a month and a half now, and I’m possibly way too excited to get started. It’s late right now (that’s kind of how excited I was to get started) but I will try to post some content tomorrow….after getting some “real” work done, ha!